Nov. 1, 2018 – Bandit now offers extending Kesla loaders with radio remote controls on its Intimidator 21XP hand-fed chippers, giving land-clearing professionals, tree care companies and right-of-way contractors a powerful all-in-one tool to dispose of limbs and even whole trees. “This option can eliminate the need for additional workers on the ground, or additional equipment brought to the jobsite,” Morey said. When not in use, the Kelsa loader folds up on the front of the chipper where it’s out of the way, never impeding the discharge chute or limiting access to common maintenance items. With a rated chipping capacity of 21 inches, a huge 24.5-in. by 26-in. chipper throat opening, Bandit’s Slide Box Feed System and engine options up to 350 horsepower, the Intimidator 21XP is simply the ultimate hand-fed chipper. 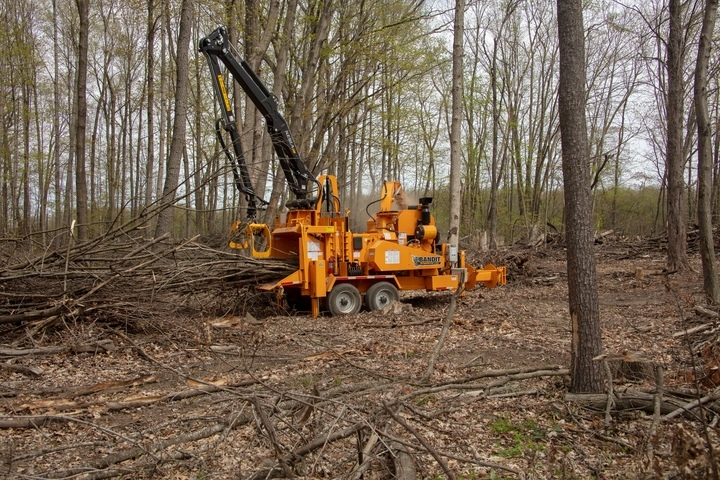 This machine has no problem processing large whole trees, and is designed for tree services specializing in large tree takedowns, land clearing operations, or any projects requiring the highest levels of production and performance. Learn more about Bandit Industries by visiting www.banditchippers.com or by calling 1-800-952-0178.